Prague powder No. 1 is a curing mixture that is used in making cured meat products that require short cures and will then be cooked, such as sausages, including hot dogs, fish, and corned beef. The federal government mandates Prague salt be composed of 6.25 percent sodium nitrite and 93.75 percent table salt (sodium chloride), making Prague powder No. 1 mostly salt. Salt works as a preservative through a process called osmosis, where the water within a cell is drawn out through the cell walls. One teaspoon of Prague powder mixed with cold water will cure about 5 pounds of meat. Food spoilage and food poisoning are caused by single-celled organisms called bacteria. Salt pulls out the water from within the bacteria cells, killing them. Sugar does the same thing, which is why foods with high amounts of salt or sugar are among those that often don't require refrigeration. A special property of Prague powder No. 1 is that it prevents the growth of the deadly Clostridium botulinum bacteria, which causes botulism. Its second ingredient, sodium nitrite, is a natural compound prevalent in soil and found in vegetables such as carrots and spinach (nitrogen is 78 percent of our atmosphere). Sodium nitrite is known to prevent the growth of bacteria, and is also an effective anti-toxin and considered an essential medicine by the World Health Organization. Combined, table salt mixed with sodium nitrite form a highly effective food preservative, which also has antimicrobial properties. The pink coloring is added to Prague powder No. 1 so that it won't be mistaken for ordinary salt. Prague powder is what makes cured meats pink in color; the Prague powder interacts with a component of the protein in meat called heme, which is the part of a red blood cell that gives blood its color. Prague powder No. 1 is only meant to be used in very small quantities. Accidentally adding Prague powder No. 1 to food as you would normal salt would make you ill. The pink color is to prevent anyone from making an accidental swap. Prague powder (sometimes Prague salt) got its name since the process for adding sodium nitrite to meat for the purpose of curing it was first developed in Prague when it was part of the Habsburg Empire. Like a number of other food items, Prague powder No. 1 can be found under different names, but its purpose and use in recipes remains the same. 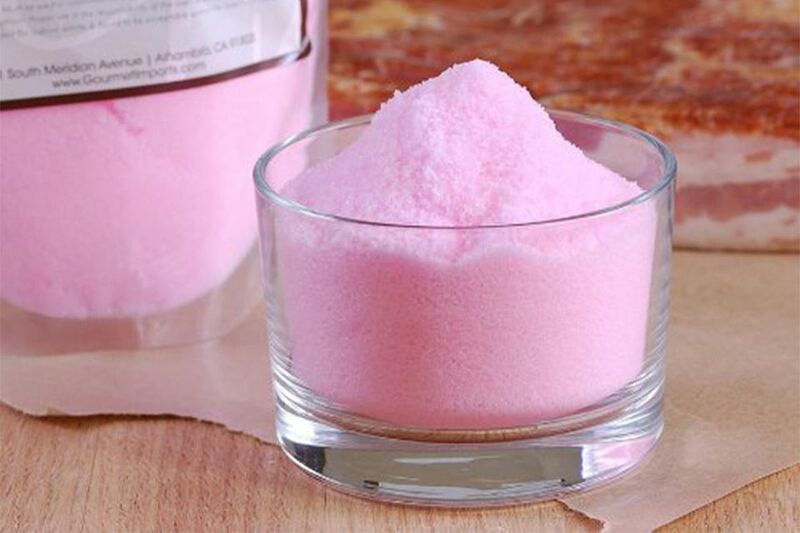 It is known as insta cure and modern cure, but you may also see it labeled as tinted curing mixture, TCM, tinted cure, curing salt, and pink salt. Prague powder No. 1 should not be confused with Prague powder No. 2, which is used in making dry-cured meats that require a long curing time and usually no cooking, including hard salami, pepperoni, and prosciutto. You can purchase Prague powder No. 1 at online retailers that sell herbs, spices, and seasonings, at some hunting and sporting goods stores (Prague powder No. 1 is a key ingredient in making jerky), and at major retailers and grocery stores that sell herbs and spices. What Five Spices Make up Chinese Five Spice?